Italian painter Marco Casentini opens a show, Recent Paintings, at Brian Gross Fine Art on Thursday, January 4, with a reception for the artist from 5:30-7:30 pm. 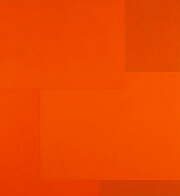 The exhibition will continue through Feburary 17 and features his signature geometric abstractions in vibrant color. 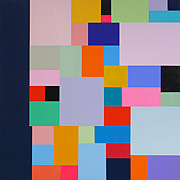 Working in acrylic on canvas, Casentini refines his investigations through bright, multi-colored planar paintings. 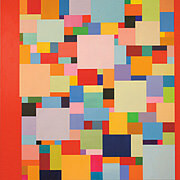 The interplay of the rectangular elements of intense, saturated colors with sharp, clean lines make the paintings pop. 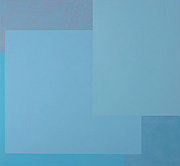 In a new twist, he paints two, long vertical planes of a single color on either side of the canvas that emphasize the energy created by the smaller rectangles within. In contrast to these colorful paintings, Casentini makes quieter reductive, monochromatic paintings where subtle changes in surface and transparencies create shifts in the spatial reading of these moody landscapes. 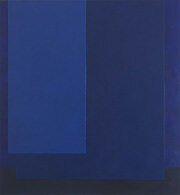 Here, the artist explores the geometric space within a limited color range. The overlapping planes of varying hue and texture keep the eye constantly moving, fluctuating between flatness and dimensionality. Born in La Spezia, Italy in 1961, Casentini studied painting at the Accademia di Belle Arti in Carrara, Italy. His work has been featured in solo and group exhibitions throughout the United States, Italy, Germany, Switzerland, Austria and the Netherlands, as well as Australia. This is his fourth solo exhibition with Brian Gross Fine Art. He currently lives and works in Milan, Italy.